This level has medium difficulty. For this level try to play from top part of the board where more candies are available to play. 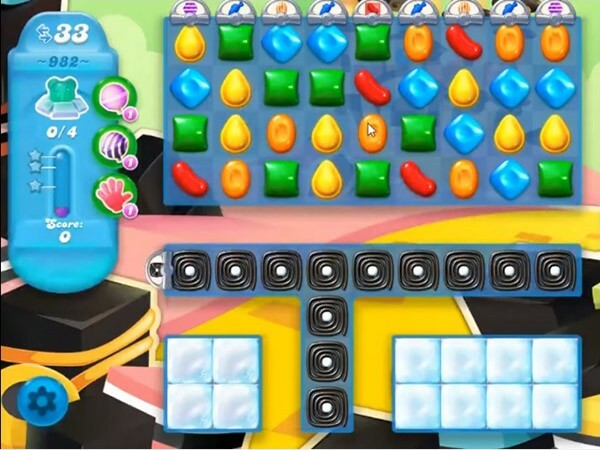 Make special candy and combine them with other special candy to break the blockers that are in bottom part of the board. 1) I only have 28 moves 2) the special candies that fall from the top, you MIGHT get 2, 3) I have yet to see a bear 4) get advice, play from the top…DUH 5) this level plain STINKS!! Oops, I was mistaken, I only have 23 moves. For that special candies should drop with every move!! 33 moves would be nice thanks!! SERIOUSLY CRAPPY LEVEL!!! Can’t use boosters, because you can’t get matches to begin with!! Any striped candies the game gives, either goes the wrong way, or they hit air. DONE!! I only have 23 moves. Boosters are useless. This level is impossible. Sounds like at one point there were 33 moves. The extra 10 moves would be nice otherwise I’m done playing this game. You make a level too hard and people just give up. Like Farm Heroes Saga 1 I could never pass a level so King made super Farm heroes which i play now. They will have to make a super soda crush if no one passes this level or change the moves back to 33. Who’s dumb idea was it to change it to 23 anyway? I only have 23 moves. This level seems to be impossible should be some extra moves. why do I have only 23 moves? I am beginning to think this is a scam, the only way to pass the higher levels is to buy more lives. I am over candy crush soda. At least with candy crush you can advance. Wat een rot level niet tedoen,en een zeer slechte vertaling! This game level is not possible,i do’n understand this game! ,!!? I agree with others. I’m done! this level is impossible with only 23 moves Occasionally I will buy five more moves or boosters if I only need a few to finish a game that’s not ‘fun’ so I can get on to the next one. It would cost hundreds of dollars to finish this game. They aren’t getting ANY MORE dollars from me! I’ve bought so many lives to get to this level which is virtually impossible with 23 moves. I’ve observed that on many levels even if you turn a booster into 50 fishes it will end up leaving one left so you have to buy 10 more lives. Beginning to believe it’s a scam and will stop playing. I only have 27 moves! Since this level seems to NOT have a specific number of moves it seems like a rort to make us buy moves. Not impressed ? Only gave 27 moves. Not enough even with some boosters to complete this level. Need back to the 33 moves. Why change it? I’m not buying any moves to get thru this. It’s ridiculous with 33 moves also. This level needs to be redesigned! Too hard!! Been stuck for weeks now. Done with Candy Soda! 23 moves to complete, so riduculous!! What a waste of time this level is, I have only got 1 bear after countless tries, even the boosters do not help to penetrate the damn liquorice, I need a rest from this.